Got an obsession with demonic playthings? Come clean already because, spoiler alert— we also share the same obsession as you— the obsession with killer toys. Annabell pitted against Chucky and Tiffany going toe to toe with Billy the Puppet are just a few of our recurring fantasies. Would we have the chutzpah to defend ourselves against these demonic dolls? Nothing is certain when you're dealing with dark souls trapped inside tiny, plastic bodies. A favorite dark soul disguised as a childhood trinket is Slappy the dummy from the popular Goosebumps franchise. He's the perfect combo of creepy and comical and guess what? Now he comes in pin-form and we can't get enough over his itty bitty psychotic smile. Infuse a little hint of Slappy into your outfit as a way to express your obsession with killer dolls in the healthiest way possible. 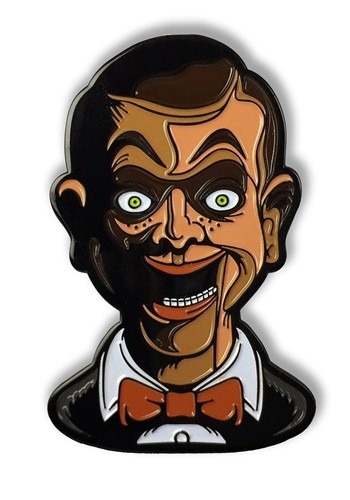 Measuring approximately 2-inches tall, the officially licensed enamel pin depicts the living ventriloquist dummy from the Goosebumps series, featuring green eyes, an open smile and an overall insane look. Don't worry this dummy pin won't steal your soul but we can't make any promises about our selection of exclusive Slappy costumes.